feeling listless -- "Poverty of goods is easily cured; poverty of the mind is irreparable." feeling listless: The Ghost Monument. TV Custard creams! The TARDIS makes custard creams! If jammy dodgers seemed on brand for the eleventh Doctor, custard creams feels like the last thing you might expect for thirteenth and yet totally correct, as was her response which was munch the thing down as quickly as possible. Lately I've been attempting to lose some more weight, but custard creams keep appearing the cupboard and my self control isn't what it once was. The wreckage of teeth in my mouth thanks to a couple of decades of tooth grinding can't really bite into them any more without some risk. But by-gad they're perfect for dunking, so long as you don't keep them in there too long. Plus they're super cheap, about fifty in a packet for forty pence in Tesco. Even less in the value range at Aldi. Oh dear, I appear to have eaten another one. Second stories or episodes are the first time we really get a chance to see how a new incarnation of the Doctor exist at full wattage after their introductory installment(s) and have an inclining of how the given actor is really going to approach the role. The End of the World was structurally still part of RTD's task in demonstrating the breadth of the show at this early stage although Chris had Boaked himself out by then. While New Earth on reflection does give us a roadmap to the Tenth Doctor's personality, the body swap story meant we still didn't really see him and Rose in action until Tooth & Claw. The Beast Below is maligned but again it's an on-point expression of who the Eleventh Doctor would be, which could also be said of Twelfth Into The Dalek for worse, much, much worse, the start of that season's apparent project to make us actively dislike him. It's too early to really say how The Ghost Machine fits into that tradition, Jodie Whitaker's Doctor and her performance is still cooking. Without knowing the production schedule, we don't know were this sits in terms of how comfortable she in the role, and there are occasions, like previous Doctors, when she is still trying to calculate the balance of exposition over emotional beats. She's also still for the most part, not the viewpoint character, which causes us to be slightly distanced from her, which is something which has oscillated across the years but we've recently become less used to. Usually if she's in close-up, it's for an important moment. With three companiofriends to deal with, she's regularly at the back or middle of the framing, or emerges towards the end of a scene between two other characters, usually to help chivy the action along. Which isn't to say she isn't delightful. She is. Her performance and this version of the character is a welcome change from the introspection of recent incarnations with the weight of the universe on their shoulders. She doesn't need to ask herself if she's a good person. She just is and knows it. She's especially mobile too, weaving in and out the other characters and sets like a dynamo, rarely still, sonic at the ready. In the scene on the shuttle when she has little choice to but sit down, this Doctor seems trapped, impatient. These are writing, performance and production choices and there'll doubtless be a moment when we see her sat alone, contemplating and it'll be all the more powerful because of it. Jodie's nuance shines best in the interior scenes. Perhaps these were shot later? That's especially true of the closing moments when the TARDIS finally returns and thirteenth the focus again, barely holding back the tears as her old friend returns. We finally see her interior soul as she rests herself against the time ship's exterior, caressing the sign. Then as the door opens, an awestruck look usually reserved to companions radiates from her as she glances around the new interior, the TARDIS having decided on as an expert notices, "basically the 2005 one with crystals instead of coral" but massively huge, augmented by CG. It's in these moments we see Jodie really settle into the role, calmer, more authoritative. 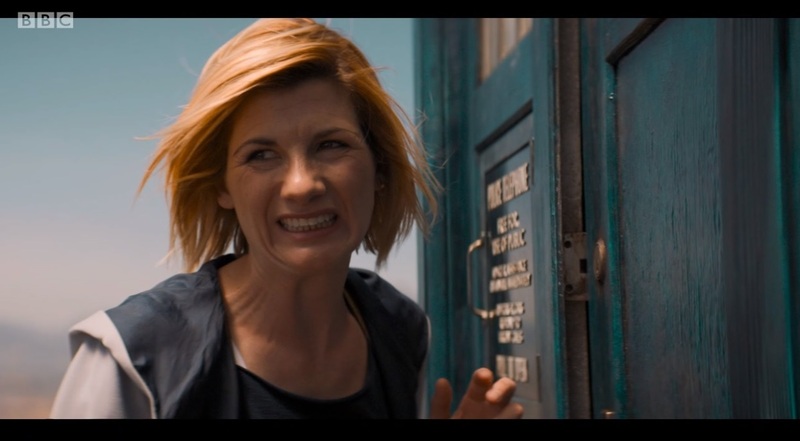 As season seven (the first one) shows the Doctor's mojo, her sense of being is directly connected to her TARDIS and she's not complete without the ability to step into the fourth dimension. I like it too. How long has the TARDIS been phasing in and out on the planet that it should become a mythic item within the planets history such that it would be branded with the name "ghost monument"? Like the Pandorica, has it simply always been there, shimmering back and forth into reality like a dimensional transcendental Brigadoon? Some have complained that the audience didn't ever really think the TARDIS would ever be completely lost which devalued the conclusion, which is nonsense. Within the DNA of the show is the idea that a TARDIS team would be unable to escape from a place because a girder had dropped in front of a door, it'd fallen off a cliff, down a mineshaft, sunk to the bottom of the ocean or simply been in a chippy mood. We know the she and the Doctor will be reunited eventually. It's simply a mechanism to cause the Time Lord to bump into another adventure. One element which Chibnall is keen to demonstrate is the Doctor fighting with her wits rather than guns, even the to point of having Ryan acting like a numpty with a large gun to demonstrate the point, marinating in the juices of toxic masculinity. As you know, I've acknowledged that THE DOCTOR DOES NOT USE GUNS unless he does, sometimes, but it's good that the show goes to these lengths to broadcast this imagine, especially now. In order to show this is the same person who's been at the centre of the show for the past half decade, we hear Thirteenth also namedropping and practicing Venusian aikido. I bet there are some jelly babies in those massive pockets of hers. You could argue that leaning heavily on such things might risk the character becoming a bit generic, but Jodie's Doctor so far has been anything but. Second installments also need to have a story significantly different from the first so that potential new viewers can get a feel for the premise. On that score, The Ghost Monument is fine, certainly less of a curiosity than some of the others. Judging by the plot synopses for coming adventures, Chibbers is following the recent recipe of offering a future and historical story in the first couple of weeks, although this was a much more stripped down affair with less characters and a very clear, specific story goal. Comfortingly tab A into tab B. You could imagine the content of this race in most Who contexts although obviously in a novel or audio because there's no way in the world the show could afford to go and film in such a picturesque landscape. Abroad. For this long. Well, hello gorgeous. After the cinematic first episode, it's usual to shift into a much more studio based affair to save money. Instead we're now in HBO or Netflix territory in budget terms apparently, although I'd be interested to know if lobbing another couple of episodes from the season means that the budgets for those have been amortized across the rest. Previous episodes have shot abroad and had some scale, but this finally feels like its achieved the teenage dream of producing a feature film per week. Were the ruins a build or already on site in South Africa? How did the spaceship crash manage to look so convincing? Without Confidential, we can only hope that Andrew Pixley has his archival pick axe at the ready and a venue to provide us with these titbits. Extra issues of The Complete History perhaps? For all the scale, this is still a character piece. As I predicted last week, with more companions, there's less need for guest spots but also a greater opportunity to provide varying viewpoints on aspects of the story like the aliens or the planets they inhabit and carry over stuff from previous episodes. Now it's not just up to the Doctor to sympathize with those who've lost loved ones or ask the difficult questions, and this new TARDIS team is becoming quite the Greek chorus. Graham and Ryan are also given a chance to consider Grace's death (although it's odd that they seem to have waited until now rather than either before or after the funeral) and the Doctor's clear affinity for Yasmin putting her trust and faith in the police officer. All of their reactions feel very real too, astonished at the new surrounds and predicament and unafraid to show it. Small but remarkable guest cast, British cinema legends all. I've been mad keen on Susan Lynch since she co-starred with Rachel Wiesz in the millenium British noir Beautiful Creature, a passion which was crystallized by Downtime, no, not the Bill Baggs psychodrama, but the lift thriller co-starring the Eighth Doctor in the period after reading the Earth arc BBC novels trying to decide which other McGann performances could be considered canonical even though the character he was playing had a different personality and name. She initially seems ill at ease with the jargon but is utterly riveting while describing how her home planet has been laid waste. Shaun Dooley's playing less against type but has the chance to offer more lightness than usual. Art flipping Malick plays a hologram who doesn't feel like he's completely done in this series. Which segues us about as neatly as The One Show to the other surprise of the episode. A story arc. Who has been very continuity and mythology heavy in recent years, often at the expense of telling the stand alone takes which are the DNA of the show. Around seasons six and seven, the only real place you could experience a story unconnected to anything else was in the novels or AudioGo audio books. In the preshow publicity, Chibbers at al specifically said that this would be ten episodes with stand alone stories implying a return to the old format of being able to pretty much watch the stories in any order and it would still make sense (something the dvd releases could take advantage of across its decades long project). Well. Apart from the aforementioned perfectly natural conversation carry overs from the previous week, no "special treat to cheer us all up" we now have flying scarves pulling something called "The Timeless Child" from Jodie's brain, a hitherto unmentioned piece of Time Lord ephemera which seemed to momentarily knock her off balance. Any relation to the Nightmare Child? Is there an intergalactic creche filled with epic sounding youngsters like the Quantum Child, Apocalyptic Child and Oblivion Child sharing the sandpit? Or is it something closer to home? How is this connected to the Stenza? Is it connected to the Stenza? Like Grace's unusual death last week, seeds are being sown which will either be resolved in eight weeks or Chibbers will be dragging us along right through the seasons China has already licensed. Tomorrow's another London day for this writer (I'm visiting Greenwich again for some shopping) so I'll bring this to a close at the beginning and the new title sequence, banged straight into from the announcer for the first time since Rose. I think. Throwing out the orchestral majesty of the Murray Gold era (justified by RTD because he thought the Delia Derbyshire version sounded a bit sad) (hrumph), new composer Segun Akinola resurrects the original's mysterious, uncanny sound, with percussion underscoring a reworking of what sounds like the original Radiophonic Workshop recording. The outtro is noticeably more dramatic but like 2005 version denies us the middle eight, which wouldn't make our head spin with excitement until 2007. Always good to hold something back. Like the music, the credits pay homage to the past whilst being entirely futuristic offering a mini-history of Who titles across the first couple of decades. It begins with something akin to the first decade or so, rotating shapes offering the impression of the time vortex from the 60s and early 70s. They're then married with the fluid artifacts of the split-scan methods from the late 70s. Finally we're in the starfields of most of the 80s. But they're all of a pieces and transition between each other perfectly. No face or TARDIS this time. It's created by the mysterious John Smith, he or she of Wholock fame who director Rachel Talalay contracted to provide some of the special effects for the last series now being given this ultimate task. Well done. So we're over the second episode bump just about intact. Can we define how Chibber's approach differs from his predecessors yet beyond the sheer scale of the thing? A certain back to basic, more traditional approach to the storytelling, more character, less plot based material, an abundance of script which begs for rewatching in order to catch of all the dialogue, especially from the Doctor. If anything, the reason I'm grasping at straws is because he's taken a step back, is less interested in imprinting his own personality, perhaps because unlike RTD and Moffat, he's less known for having a particular approach to writing, Born and Bread, Camelot and Broadchurch not really having a common theme or thread. So far, so good.